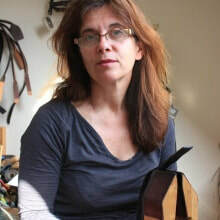 Helen Bull is a qualified saddler and a member of the Society of Master Saddlers. Her company, HB Saddlery and Leatherwork, specialises in the production of fine-quality bespoke leather goods. They use only the best quality leather and fittings to hand make products which not only look, feel and smell amazing, but are long lasting, fit for purpose and represent good value. Helen Bull is a qualified saddler and specialises in bespoke leatherwear for the discerning customer. Using only the finest materials and fittings, all items are 100% handmade.